Wildfire season in North America is off to a raging start this year. Fire activity in the western United States increased significantly in June as preexisting dry conditions and record-setting heat events created the perfect conditions for wildfires across portions of the American Southwest, southern Great Basin, and southern California. According to the governmental National Interagency Fire Center (NIFC), from January 1 to July 17, 2017, 34,586 wildfires had burned 4.3 million acres in the U.S., compared to 28,992 fires that burned 2.4 million acres in the same period in 2016. On July 1, 2017, the NIFC predicted above normal significant fire potential through August. That prediction is proving to be accurate. Just in the past few weeks, wildfires have caused extensive damage in Alaska, California, Montana, Colorado, Arizona, and in Canada. As of July 17, 2017, 42 large fires were burning more than 867,000 acres in 12 states, including Alaska, Arizona, California, Colorado, Idaho, Montana, Nevada, North Dakota, Oregon, Utah, Washington, and Wyoming. Multiple California wildfires have recently left scenes reminiscent of a “zombie apocalypse.” On Monday, July 18, in California’s Central Valley, residents were forced to flee their homes after authorities ordered evacuations. Wildfires have charred more than twice as much land mass in California so far in 2017 than a year earlier, according to a Forestry and Fire Protection spokeswoman. That should come as no surprise, since California is the most wildfire prone state by nearly any measure. In 2016, California ranked second both in terms of the number of fires and number of acres burned. Historically, California also tops the list of U.S. states with the costliest wildfires. According to Munich Re, California wildfires are the second most expensive natural hazard after earthquakes. But as that chart shows, there’s plenty of costly damage caused by wildfires elsewhere. The damage from the 2016 wildfires in the Tennessee Great Smoky Mountains killed 14 people, led to mandatory evacuations, and caused more than $500 million in damage. The 2012 Waldo Canyon fire in Colorado Springs, Colorado was the costliest wildfire in Colorado with insurance costs of $453.7 million from more than 6,600 claims. Massive and costly wildfires are also a problem for our northern neighbors. Wildfires that broke out northeast of Vancouver nearly three weeks ago continue to spread rapidly across large areas of British Columbia. In addition to the 3,000 firefighters currently battling the flames, local authorities have asked for Canadian federal military assistance, and Australia sent 50 firefighters to assist. Local officials have declared a state of emergency, and more than 45,000 people have been forced to evacuate, including an entire town with a population of more than 10,000. Not surprisingly, the wildfires have already disrupted industry in the region. Forestry producers have suspended operations, due in part to employees who have been forced to evacuate. Pipeline operator Enbridge Inc. took a natural gas compressor station offline and has no present timeline for restarting it. And the British Columbia Cattlemen’s Association says 30,000 cattle are threatened by the fire. 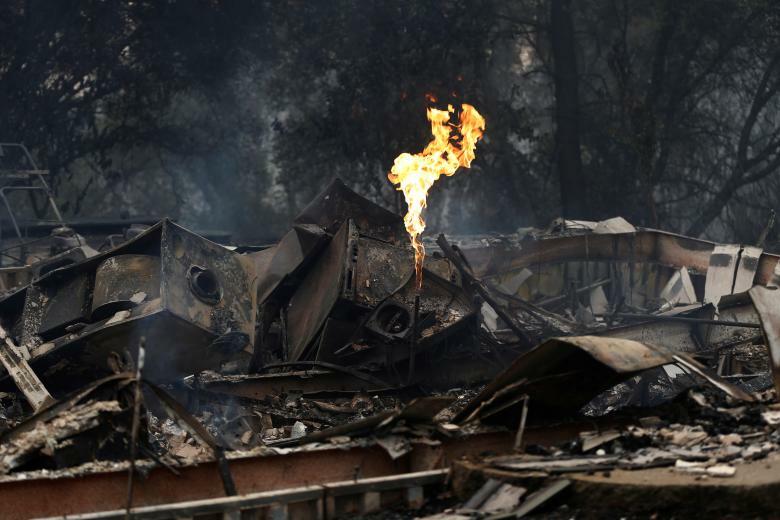 Authorities anticipate that the wildfires will get stronger before they are contained. From the start of wildfire season on April 1 through July 12, British Columbia has seen 604 fires, with damage estimated at US $41 million. In 2016, wildfires in the oil-rich area of Fort McMurray, Alberta displaced nearly 90,000 people and caused more than $3.58 billion in damage, making it the most expensive disaster for insurers in the country’s history. Thirteen states in the western U.S. that are currently at high or very high risk of wildfire damage represent a combined total property value estimated at more than $237 billion. California, Colorado, and Texas have a combined property value exceeding $188 billion in areas of high or very high risk. Most losses in a wildfire event result from destroyed or partially burned structures and their contents. Of course, damage to real property caused by fire or smoke from a wildfire, and even damage from water used to fight the fire, is usually covered by homeowners, renters, and commercial property insurance policies. The contents are typically covered up to a certain limit, and homeowners’ and renters’ policies commonly cover living expenses incurred by the insured during repair or rebuilding. A critical coverage for business owners in high wildfire risk areas may be business interruption coverage, which—with some limitations—covers the profits a business would have earned if the wildfire had not occurred. Business interruption coverage generally covers income loss sustained if operations are suspended because of physical damage to insured property and resulting from a peril insured by the policy. Such coverage may also cover additional operating expenses incurred as a result of the wildfire, including the expense of operating out of a temporary location even if business activities are temporarily halted. Most policies include a “waiting period” so that the loss-of-income coverage does not begin until a specified number of hours/days after the triggering event. In Oregon Shakespeare Festival Association v. Great American Insurance Company, No. 1:15-CV-01932-CL, 2016 WL 3267247, at *1 (D. Or. June 7, 2016), vacated by joint request of parties, No. 1:15-CV-01932-CL, 2017 WL 1034203 (D. Or. Mar. 6, 2017), the insured sought coverage for business income losses that it incurred after nearby wildfires caused smoke, ashes, and dust to infiltrate the theater, coating the seating, HVAC, lighting, and electronic systems with dust, ashes, and smoke. The plaintiff insured was forced to suspend operations and cancel performances for several days to perform cleaning, replace air filters, and allow the smoke in the air in the theater to dissipate. The court found that the insured sustained “physical loss of or damage to property” when the wildfire smoke infiltrated the theater and rendered it unusable for its intended purpose, and concluded that the policy covered the insured’s business interruption losses. The case was later vacated by joint stipulated request of the parties, but it remains an excellent example of the type of wildfire damage that can trigger business interruption coverage. Coverage may be available for the income a business loses due to a mandatory evacuation order by civil authorities, even if the insured business itself incurs no physical property damage. Civil authority orders commonly lead businesses to suspend operations, either due to the threat of the wildfire itself, or the loss of employees or customers who have been evacuated. As a general matter, a civil authority clause provides coverage for lost income when access to insured property is prevented or impaired by an order or action of a civil authority because of damage to property other than the insured property. Civil authority coverage varies widely by policy, but generally the insured must demonstrate that (1) a peril covered under the policy (e.g., fire) caused physical damage to some property; (2) that said peril also gave rise to an action or order of a civil authority (e.g., the denial of access to the business), that (3) proximately caused a loss of business income. When a civil authority order alone causes the business interruption loss, without any related property damage caused by a peril covered by the policy, there usually be no coverage. See e.g., Bamundo, Zwal & Schermerhorn, LLP v. Sentinel Ins. Co., No. 13-CV-6672 RJS, 2015 WL 1408873, at *4 (S.D.N.Y. Mar. 26, 2015) (holding the plaintiff’s business interruption loss arising from New York City’s evacuation order related to Hurricane Sandy was not covered under the policy’s civil authority provision because the evacuation order was issued as a direct result of flooding, which was an excluded peril under the policy). Likewise, if the civil authority order simply makes access more difficult, without actually prohibiting access, there often is no coverage. See, e.g., Southern Hospitality, Inc. v. Zurich Am. Ins., 393 F.3d 1137 (10th Cir. 2004) (finding no coverage under plaintiff hotel’s civil authority policy because FAA order prohibiting airplanes from flying did not prohibit access to hotel operations); Kean, Miller, Hawthorne, D’Armond McCowan & Jarman, LLP v. Nat’l Fire Ins. Co. of Hartford, No. 06-770-C, 2007 WL 2489711 (M.D. La. Aug. 28, 2007) (finding no coverage under plaintiff hotel’s civil authority policy because the recommendations by Baton Rouge officials to stay off the streets did not deny access to business’s premises). Given the substantial 2017 wildfire activity, we expect a corresponding surge in wildfire-related insurance claims.